Colour: PinkWidth: Less than 45"
100% Pure Wool Tweed checks herringbone Remnants Offcuts Patchwork Crafts 10 x4"
Silk Viscose Velvet fabric - Multiple Colours - 43"
100% Pure Silk fabric Organza - 5.5 mommy - Natural White, Black - 42"
100% Cotton Poplin Printed Floral Ditsy Rose & Hubble Printed Fabric 112cm - 44"
'Imagine' from Northcott Fabrics. 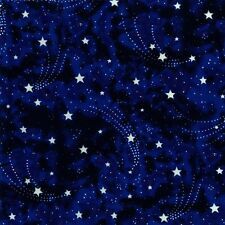 This wonderful digitallu printed fabric of a nebula is great to add to your stash for a variety of projects -I'd like to make a bag with it! and so on! So if you need 1.5m for your project simply order 6 fat quarters. Alexander Henry tattoo fabric - featuring a cornucopia of hearts, skulls, butterflies, daggers and other wonderful details on a black background. Sold by the Fat Quarter. ♥ Suggestions for use – quilting, crafting and dressmaking. Eden pop by Dashwood 100% cotton patchwork & quilting fabric per FQT bees! 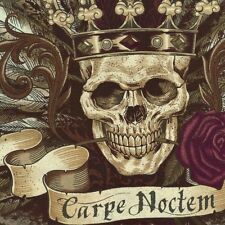 ♥ Height of skull above 'carpe noctem' - approx 9.5cm not including crown. See more of our Alexander Henry fabric here… Alexander Henry. See other types of fabric in this genre here… Gothic. ♥ Suggestions for use – quilting, crafting and dressmaking. See more Fairy fabric here… Fairies & Fantasy. ♥ Suggestions for use – quilting, crafting and dressmaking. Not intended for use in children's sleepwear. ♥ Height of tallest fairy – approx 13cm. Fabric Facts. ♥ Suggestions for use – quilting, crafting and dressmaking. Not intended for use in children's sleepwear. See other fabrics in this genre here…Gothic. ♥ Washing – machine wash warm normal cycle, tumble dry low. 'Floral pets - kitty' from Blend fabrics. Machine wash with similar colours. Do not dry clean or bleach. Wash & tumble dry low/cool & use a cool iron. 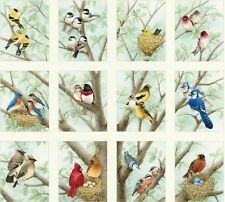 It is 100% cotton - 112cm/44" wide - 150 gsm. Mutli coloured paw prints from Windham fabrics! It is 100% cotton - 112cm/44" wide - 180 gsm. 1 fat quarters = 50 x 56 cm. 2 fat quarters = 50 x 112 cm (i.e. half M). 4 fat quarters = 100 x 112 cm (1m). Variety of decorative projects including craft, sewing, lingerie. How long will it take to arrive ?. (Colours may vary from pictures. ). 100% Pure Wool Tweed checks herringbone Remnants Offcuts Patchwork Crafts 10 x6"
Alexande r Henry Catacombs fabric - featuring grey skulls on a black background. Sold by the Fat Quarter. ♥ Suggestions for use – quilting, crafting and dressmaking. Not intended for use in children's sleepwear. THE FABRIC IS A JOHN LOUDEN DESIGN AND IS A VERY GOOD QUALITY WITH A LOVELY FEEL T IT. THE FABRIC IS A COTTON BATIK IN A RANDOM DESIGN OF RED, GREEN AND PURPLE ON ORANGE (GOLD). Alexander Henry tattoo fabric - featuring a cornucopia of hearts, skulls, butterflies, daggers and other wonderful details on an ivory cream background. Sold by the Fat Quarter. See more of our Alexander Henry fabric here… Alexander Henry. SALE! Rose & Hubble Red & Beige Floral Dress/Craft Cotton Poplin Fabric SALE! Red & beige floral print from Rose & Hubble. 100% cotton poplin. 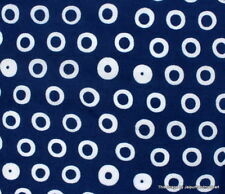 Material: PoplinWidth: Less than 45"
♥ Suggestions for use – quilting, crafting and dressmaking. Not intended for use in children's sleepwear. See other fabrics in this genre here…Gothic. Fabric Facts. See more of our delightful fabric here… Fabrics. 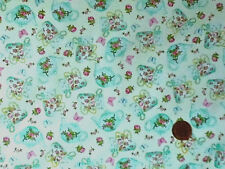 This gorgeous fabric features a host of lovely fairies and rose flowers on a pale pink background. See more Fairy fabric here… Fairies & Fantasy. ♥ Height of tallest fairy – approx 13cm. ♥ Suggestions for use – quilting, crafting and dressmaking.